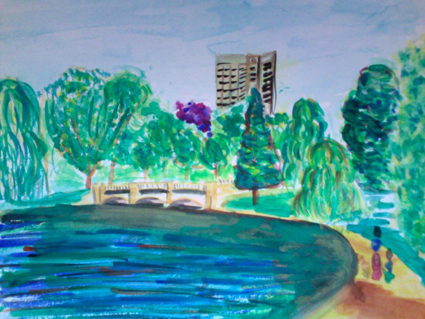 Today, after going to Tuttle and having a lovely Friday morning talking to friends and making new ones, I headed to Hyde park with my watercolors, intent on painting something in the afternoon sunshine. What you see above was my one and only creation — a view of the end of the serpentine, facing the Hilton Hotel (which you can see rising over the trees). I was never particularly talented with watercolors, but I still like to try. And sitting on a bench in the middle of the park, I just didn’t really have the patience for mixing colors or measured brushstrokes. I’m also pretty horribly out of practice, though it was fun to be outside, doing something. Writingwise, this week has been busy. It was my last week at Sugarscape.com. In my 6 weeks there, working three or four days a week, I managed to write 69 stories, not counting competition copy (the numbers on my page are a bit off since it includes individual photos for galleries). It was sad to leave Alex and Becs, who were lots of fun to work with, and they bought me a lovely bouquet and a travel journal for my summer trip. I also wrote a post for Londonist, “Shocking: Amy Winehouse Arrested, Let Out on Bail,” and a post for Workology, “Want to reduce your WTD? Get a VA!” I would love for all you freelancers and small business owners who read this blog to come join me at Workology, or at least comment on my blog posts — as of today, you don’t need invites anymore to join the new social network for independent workers. And if you haven’t read the blog post about Best Supper Ever (I know, it’s just below on the page right now), go take a gander — Battlecat gave an awesome interview.